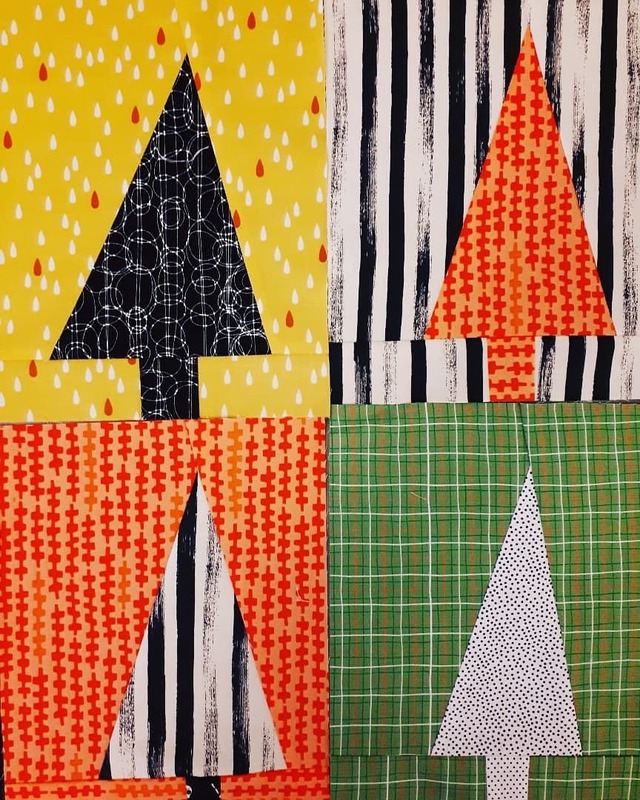 Last year when Amy Dame posted the tutorial she had some tweaks and suggestions ( http://vancouvermodernquiltguild.ca/blog/archive/past-challenges-and-round-robins/challenges-2017/november-improv-tree-blocks/ ). This year I would add that instead of making the stumps brown, I used the same fabric as the tree, or something coordinating. Seems more modern. Again, please use black and white with brights. I tried to keep the brights in a autumnal palette. And, I used a 9.5″ square ruler and then squared them up. Don’t stress about size, as with anything improv there will be variation. For every tree you submit you get a ticket to win them all, although we reserve the right to split the winnings if we get another forest like last year.